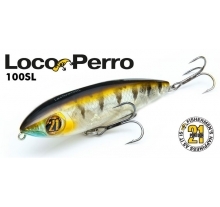 Loco Perro is a pencil-type lure, and it makes all you ever could expect from it’s game, being exciting in dog walking or sliding versions. It’s hidden secret is the original SCT – balancer system (Step Counter Type Balancer) of Pontoon21. During retrieving the ball constantly moves from left to right inside the cylinder locating in the head of lure, changing the position of lure’s center of gravity as well as direction the lure turns and follows. Thanks to the body design the water resistance is small, and Loco Perro moves free and turns easy creating bubble sounds in addition to the klicks the inside ball generates when touches the ends of inside metal cylinder. The sound of klicks is similar to the sound of Step counter, and became a reason of the name of SCT-balancer system of Loco Perro Pontoon21. SCT-balancer (Step Counter Type Balancer) of Pontoon21. The big and heavy ball moves inside the metal cylinder locating in the head of Loco Perro. This ball can not be fixed along the lure’s body axis and always tries to achieve the end of cylinder at left or at right. Accordingly, the lure’s center of gravity is moved to the certain side. 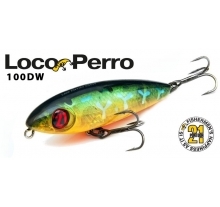 Loco Perro is a pencil-type lure, and it makes all you ever could expect from it’s gam..